In part one, we looked at the differences between the Premiership, La Liga, Serie A, the Bundesliga and Ligue 1 in terms of passing. Here, we turn to crossing. 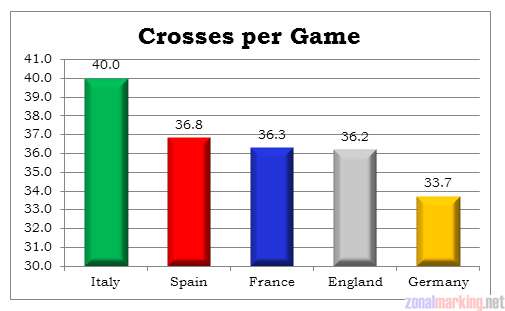 Serie A sees by far the highest amount of crosses, with the Bundesliga trailing significantly. There’s little difference between the other three leagues. This makes for fascinating reading. 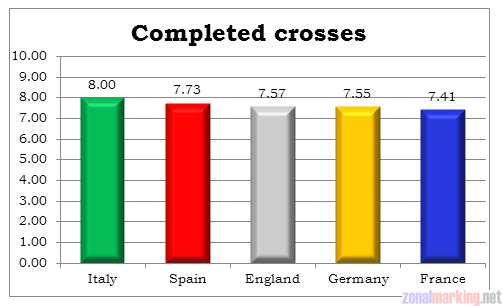 Germany may see the fewest amount of crosses attempted, but it sees the highest cross completion rate. 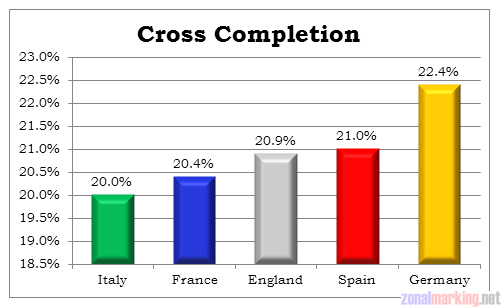 Italy sees the most crosses attempted, but the lowest cross completion rate. The correlation here is extremely strong, and demonstrates a clear difference in style. A lot of Serie A sides are playing extremely narrow in attacking areas this season (a lot of 4-3-1-2 formations) and crossing is therefore left to the full-backs. 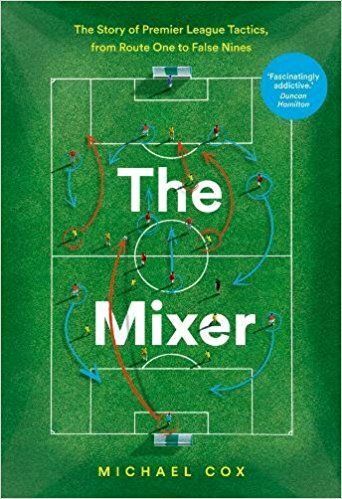 Full-backs have more space than wingers, and therefore more time on the ball to get a cross in, but they are, of course, crossing the ball from deeper positions, which means the cross is less likely to find strikers. The Bundesliga is seeing a popularity in 4-1-3-2, 4-2-3-1 and conventional 4-4-2 shapes, with traditional wingers featuring more. Wingers have less space to work in than full-backs, meaning they have less opportunities to get crosses in – but when they do get the chance, the crosses are significantly more successful than those of full-backs. 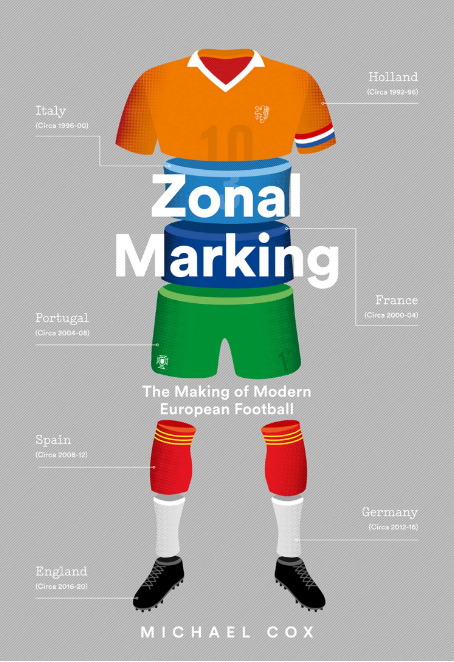 This would suggest that – in terms of end product, no one crossing style is more or less successful than the other. 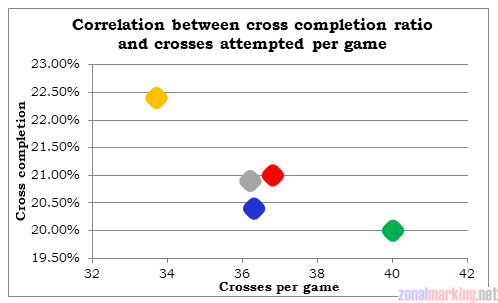 The fact that Serie A sides are more likely to complete crosses is negated by the fact they attempt far more crosses, fail with more crosses, and therefore give the ball away more frequently. France’s low rate can probably be explained by the relative lack of quality in the league. The Bundesliga just looks more interesting every year.